Google thinks it can harness the power of the huge smartphone contingent and help others learn about traffic jams. The search giant is testing a scheme where mobile phone users simply sign up to My Location on Google Maps, start the program before getting in the car, and then simply set off. Google then collates the data about everyone's location, and if they're clearly travelling down a road, estimates speed to get an idea about traffic. It's currently only being tested in the US at the moment, but it seems likely that Google will eventually bring it to the UK as it's calling the new scheme another one of its 'layers' for Google Maps, which recently debuted over here. However, it's not as simple as having a GPS-enabled handset apparently, as while Google shows that the HTC Magic and the Palm Pre both work with 'traffic crowdsourcing', the iPhone 3GS does not, which is odd when Apple's device supports sat nav applications from the likes of TomTom. 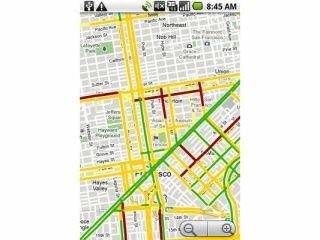 "Ever since GPS location started coming to mainstream devices, people have been thinking of ways to use it to figure out how fast the traffic is moving," says Google on its official blog. "But for us to really make it work, we had to solve problems of scale (because you can't get useful traffic results until you have a LOT of devices reporting their speeds) and privacy (because we don't want anybody to be able to analyze Google's traffic data to see the movement of a particular phone, even when that phone is completely anonymous)." Google says it will permanently delete everyone's start and end data for each journey, and highlights how this is very much an opt-in service. Although that didn't stop the outcry when Latitude was announced of course.